Driving all the way out to your local fish store every week to load up on water gets pretty old. Despite how much you may hate it, you know that your tank needs frequent water changes. As a result, a lot of experienced reef keepers turn to mixing their own water from scratch. This is not only a lot easier and faster, but it can also be a lot cheaper (more money for coral, woo!). In this guide we will review the candidates for the best reef salt, give you our top recommendations, and explain a few reasons why mixing your own water can be awesome. Instant Ocean comes in as the overall best reef salt on the market, and for great reason. Their product is far superior to other brands on the market and is trusted by thousands of aquarists. In fact, Instant Ocean is the salt mix of choice for nearly all public aquariums around the word; impressive, isn’t it? The saltwater in your aquarium is actually more than just water. Natural sea water has tons of trace elements that help keep your fish and corals healthy and strong. This is often overlooked by aquarium owners, with more focus put on lighting and tanks. In reality, nothing good can happen in your tank if your water isn’t of good quality. Luckily for us, there is nothing better for your fish and corals than Instant Ocean Sea Salt! It contains all of the necessary trace elements that make a healthy reef. In addition, Instant Ocean salt is also 100% nitrate and phosphate free (absolute must is you want to avoid algae). The 200 gallon mix kit of Instant Ocean salt will run you around $46-$50. This comes out to only around $0.25 per gallon, which is significantly cheaper than the price of premixed water at local fish stores. In addition, the 200 gallon box should last you a while depending on the size of your aquarium. Instant Ocean Sea Salt is, without a doubt, a great investment price-wise for any saltwater aquarium keeper! Mix Instant Ocean Sea Salt with dechlorinated tap water or RO/DI water. Again, make sure the water that you mix it with is dechlorinated, as this salt will NOT neutralize the chlorine. For small quantities, it is recommended to mix one cup of salt with two gallons of fresh water. This should give you the right specific gravity. Stir mixture until Instant Ocean Sea Salt is completely dissolved. During this process, it is also recommended to aerate the water. Measure the specific gravity (salinity) of your water. This is best done with a refractometer. We recommend the Ade Advanced Optics refractometer. The specific gravity should measure somewhere between 1.020 to 1.024. Slowly add water to your aquarium. Make sure to test water often to make sure specific gravity is correct. 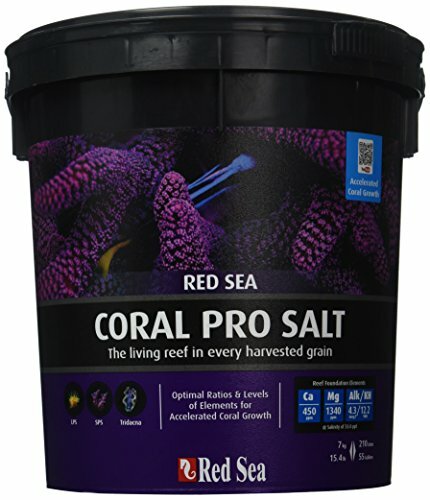 Red Sea Fish Pharm salt is made specifically for serious coral keepers. It has elevated levels of calcium and other trace elements, which encourages strong and healthy coral growth. Coral Pro Marine salt is made to be used with “mineral free” reverse osmosis water, which makes it perfect for use in regular water changes. Of course, this Red Sea salt mix is 100% Nitrate and Phosphate free, so you never have to worry about any unwanted compounds be introduced to your tank. Though Red Sea Fish Pharm salt great for use with all corals, it is specifically targeted towards use with difficult SPS corals. The ratio of calcium/carbonates /magnesium present in the salt encourages fast, healthy skeleton growth in SPS corals, which is something that reefers often don’t see. Overall, Red Sea salt provides more benefit than just a regular salt mix. With Red Sea, you will experience a healthier tank and stronger coral growth! There is no doubt about it, Red Sea salt mix can be expensive. You are paying for quality, though. As we all know, paying for quality in the saltwater aquarium keeping hobby often saves you money in the long run. the 175 gallon bucket usually runs around $70, which comes out to around $0.40 a gallon. The 55 gallon drum runs around $50, making it nearly $0.90 a gallon. Compared to Instant Ocean, this is clearly more expensive. In my opinion, the benefits of Red Sea salt are usually not worth the extra cost, unless you are running a serious SPS dominated tank. 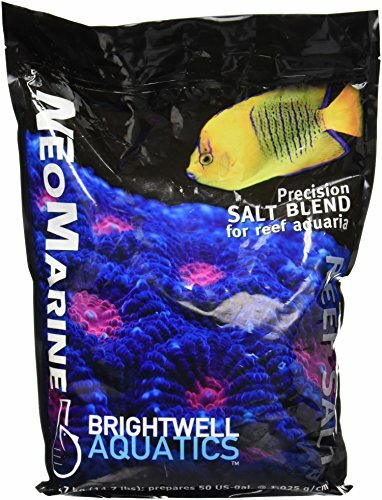 Brightwell Aquatics Neomarine Salt is a “precision” salt mix made domestically in the United States. The company takes pride in the consistency of their salt, claiming that every single batch is strictly tested for quality control. Every part of the production process is done in-house, with nothing being outsourced to other companies. For Brightwell Aquatics, this is everything that goes into making one of the best salt mixes on the market. NeoMarine salt mix was first made by reverse-engineering actual sea water, which allowed Brightwell Aquatics to identify all of the chemical characteristics necessary for a healthy environment. Hundreds of combinations of ingredients were tested until the final product matched the natural chemical characteristics perfectly. It is highly recommended to mix your NeoMarine salt with RO/DI water. Add about 1/2 cup of salt per gallon of water to get a specific gravity of 1.025. When stirred vigorously, the salt should dissolve completely within 15 minutes. To make things easier, just stick your powerhead in there to do the mixing for you! It is recommended to aerate the water while it mixes to help stabilize the pH. Brightwell Aquatics NeoMarine Salt runs around $95 for a 150 gallon bucket, so that comes out to about $0.63 a gallon. Though this isn’t the cheapest on our list, with NeoMarine salt you never have to worry about quality. It is just a personal choice whether you want to spend to extra money on a salt mix. 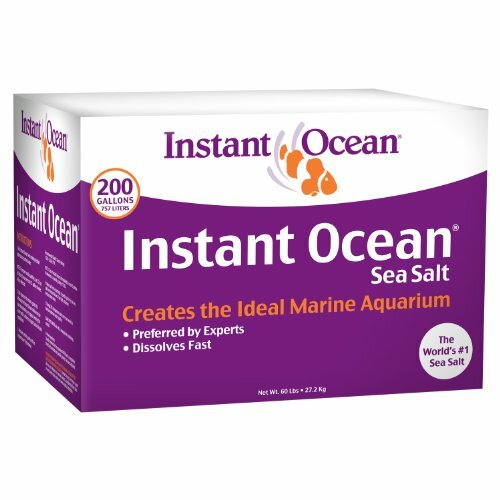 BuildYourAquarium recommends Instant Ocean Sea Salt as our number one choice for the best reef salt. In addition to superior quality, Instant Ocean Sea Salt is cheaper than anything else on the list and offers amazing value. Though you might not like the idea of mixing your water yourself, it is much easier and cheaper than going out to the local fish store every single week. With steady water changes and a quality salt mix, your saltwater reef tank will be looking better than ever!